Price & Deposit - Taking Deposits Now! 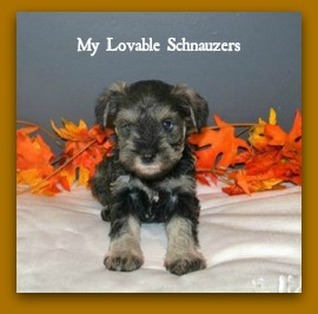 Buy a Miniature Schnauzer today! Welcome Puppy Package, Price/Deposit and Travel Options. The Scroll below for details on the the Welcome Puppy Package, the Price, the Deposit and Deposit Policy. The slideshow has pictures of the Puppy Nursery and Schnauzer Hangout in my home. My office is in there too and this room is right off of my kitchen. There are three whelping areas. They love the picture window! Continue scrolling below for the price, deposit, welcome puppy package and long distance travel options. I send weekly updates and pictures of your new puppy/litter from birth to 8 weeks old. Sometimes I include video's of them playing and other activities. I communicate often and this won't change after you take your puppy home. I enjoy breeding Miniature Schnauzers and I want that joy to reflect in my breeding program and my communications with the new families! Serious inquires please fill out application. Click here for the puppy application. I sell to pet homes ONLY, no breeding rights. More details about the price and the deposit below. Also, check out my very nice puppy package included with all puppies. I also have options for long distance traveling below. * Microchipped :All puppies are Microchipped with prepaid enrollment for life. All you do is set up your account FOR FREE @ www.akcreunite.org. This service has no annual fee. * FOLDER WITH RECORDS: All puppies receive a vaccination record from my vet which will be in a folder along with other papers. The folder will also contain the health contract, spay/neuter contract, AKC reg papers, microchip information and tips on critical fear periods. * TAIL DOCKING: The tails are docked & dew claws are removed by my vet. If you want the tail left undocked you will need to be first pick on a litter for your specified gender. The puppies will not have their ears-cropped, I do not ear-crop and my vet does not either. If you want the ears cropped you will need to arrange that procedure with your vet. * TWO VETERINARIAN EXAMS & VACCINATIONS: The puppies get TWO veterinarian check-ups, are vaccinated and are microchipped by eight weeks old. My vet also performs a physical exam before the puppies go home which includes checking for no heart murmur, lungs are free of abnormalities, no ear or eye infections, glands are normal, teeth and gums are in perfect condition for the age, and no parasites such as fleas, ticks, intestinal worms or mites. Your puppy will go home at a healthy weight, proper nutrition and well hydrated. * NO INTESTINAL PARASITES: Routine intestinal worming at least three times (sometimes more) between 3 to 8 weeks old. The brand I use is Panacur from my vet which treats for roundworm, whipworm, tapeworms and hookworm. All dogs should be treated regularly for worms as the eggs live in the soil for years and you never know what areas are infected. Tapeworm comes from a fleas bite. Not all wormers treat for all four worms but Panacur and Drontal Plus cover all four. * FLEA AND HEART WORM PREVENTATIVE: The puppies are treated with Frontline plus and Heartguard to protect against fleas and heart worm before leaving my home. I have had 100% NO fleas to date. This treatment is good for 30 to 60 days depending on your area and the flea and mosquito population. * SOCIALIZED: Puppies are socialized with other pets and in a family environment -- they are home raised and well-adjusted when you take them home. I spend a lot of quality time playing with the puppies--making sure that their transition from my home to yours goes smoothly. Between my parent's nice temperaments and how I work with the puppies before they leave, they have a solid foundation to be wonderful adult dogs. However, it is up to you to continue training and nurturing a well-balanced puppy or turn them into a monster. What you do regarding positive socialization outside the home and training has the biggest impact. * TOYS AND BLANKET: Your puppy will also go home with a squeaky toy, soft washable blanket, chew and ball which also smell like "home and litter-mates"
* FIVE YEAR HEALTH CONTRACT: All puppies are covered under a Five-Year Miniature Schnauzer Health Guarantee and Contract, which covers genetic diseases that are life threatening (such as heart valve defects). This does not cover accidents or neglect by a new owner. * PUPPY FOOD: I send home a few days worth of the puppy kibble Purina One that I feed my puppies. The sample lasts for three to four days. If you decide to use a different brand then you can mix them initially. Start out with 1/4 cup twice a day and increase the amount as they grow. * BREEDER SUPPORT... when you have questions for me or need helpful advice, I will be available 24/7 and 365 days a year. This is a very important part of breeding. New families often need advice and information as they adjust with a new puppy. ** POTTY TRAINING INTRO: Before your puppy goes home I work on paper training. In the warmer months I work on potty training outside too. This helps make it easier on you and the puppy HOWEVER, potty training is called TRAINING because it takes more than a few weeks. Full potty training takes several months. Potty training can be done in any season as puppies are more tolerant of training in colder or rainy weather than adult dogs. ** My Veterinarian is the Root Animal Clinic, in Goodlettsville, TN. **All of my dogs receive parasite medicine regularly for fleas, heart worm, and intestinal worms. Also, their vaccinations and check-ups by our vet (There are two vets total at the Root Animal Clinic). Many breeders give vaccinations themselves but I want my vet to monitor the health of my dogs and puppies. I never use over-the-counter products for my dogs or puppies -- I purchase everything from my vet (monthly heart guard, flea meds, wormer, etc..). Contact the Root Animal Clinic @ (615)-851-6868 for questions about me and/or my Miniature Schnauzers. I reserve the 1st pick of ALL litters. This doesn't mean I will take 1st pick BUT it does mean I have the option. Families pick out their puppies in the order that the deposits were received. Scroll below for my deposit policy. The total price is $1900. The deposit is $300 which makes the remaining balance $1600. A deposit is required to hold a puppy. Please be sure you are ready for a puppy when you put a deposit down. Deposits are non refundable if you decide to change your mind. 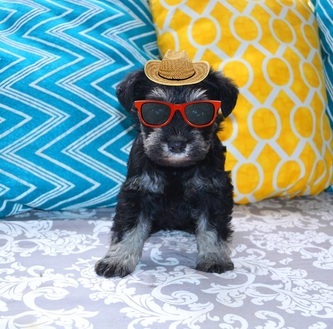 (Please read deposit policy) I put the same amount of time, money, care into every puppy and into every adult Miniature Schnauzer -- all puppies are priced the same regardless of color or gender. 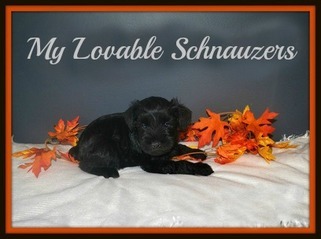 If you already have a Schnauzer from me, contact me for your discounted price. Remaining balance of $1600 after the $300 deposit is due when the puppy turns FIVE weeks old. If you purchase the puppy after five weeks of age the amount owed is due when you pick the puppy up (IN CASH) or before. *If you need me to keep the puppy past eight weeks old -- I charge $10 a day boarding fee after the stated pick-up date. DEPOSIT POLICY: I understand that sometimes it does not work out and you cannot get a puppy as planned. In this case, if you do change your mind or something happens prior to the birth of the puppy, you can move to a future litter or forfeit your deposit. Also, if you decide to back out after the puppy is born the deposit will not be refunded. Please do not send a deposit unless you are 100% certain and committed to the Miniature Schnauzer for its life and to getting a puppy from me. REMAINING BALANCE DUE: is due before the puppy turns five weeks old if you placed a deposit prior to the birth of the puppy. If you purchase the puppy after it has been born the amount owed is due when you pick the puppy up (IN CASH). *If you need me to keep the puppy past eight weeks old -- I charge $8 a day boarding fee after the stated pick-up date. Check out my Travel Options page for more information!